Orange Panna Cotta with Chartreuse-Pineapple Sorbet and Cherries. The best item on the plate was the sorbet with the candied thyme. 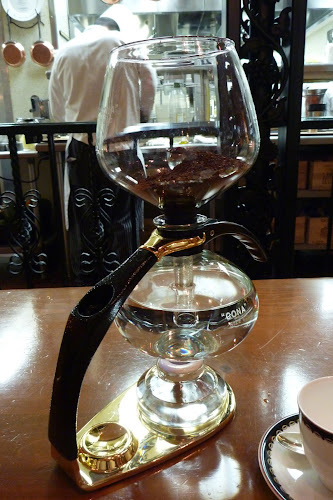 Our coffee was prepared at-table using a fancy contraption that drew the water up into the grounds, then back down into the serving vessel as coffee. We got some video of that for the next post.